Truett and Truett's Eighth Edition shows how to use economic analysis to solve problems and make effective decisions in the complex world of business. The highly successful problem-solving approach, clear and accurate presentation of economic theory, and outstanding cases combine to make the best presentation of managerial economics yet. * Walks readers step by step through specific types of problems, including elasticity calculations, cost minimization, and profit maximization. * Shows how real-world firms have addressed issues discussed in the book. 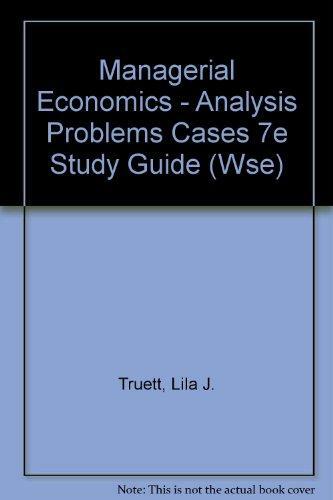 * Emphasizes the global aspects of managerial economics and its application in the international marketplace.Lila J. Truett is the author of 'Study Guide to Accompany Managerial Economics: Analysis, Problems, Cases', published 2000 under ISBN 9780470003329 and ISBN 0470003324. Loading marketplace prices 1 copies from $18.41 How does the rental process work?